The interiors are kept casual with a mix of vintage furnishings and artwork. 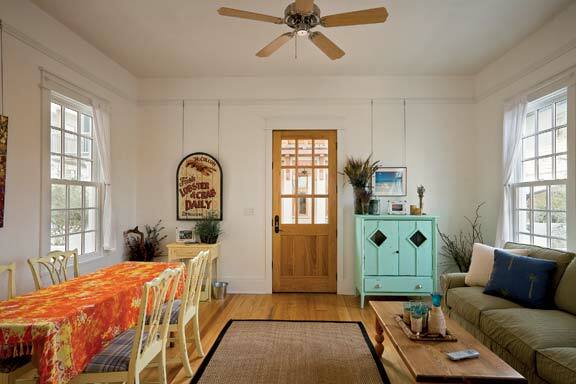 Wood floors are covered in beach grass rugs for a seaside atmosphere. Sometimes they would come for a long weekend. Other times, a week or more. When the Little Beach House on Rosemary Beach was the destination, the duration didn’t matter to architect Geoffrey Mouen: The time away was always special. Mouen and his wife, Pat, would frequently and eagerly trek the six hours from their Orlando home to their refuge on the Florida Panhandle. Relaxing days in the surf would culminate with evening dinner reservations and sand between their toes as they walked along the beach. Their twins would run freely through the neighborhood—pedestrian-only walkways stand in for streets in this resort community—or ride their bikes down to the Sugar Shack for candy. In the summer high season, the weather was always cooler than their inland home; in the winter, it was quiet as could be. Mouen would often spend the afternoons with his sketchbook. 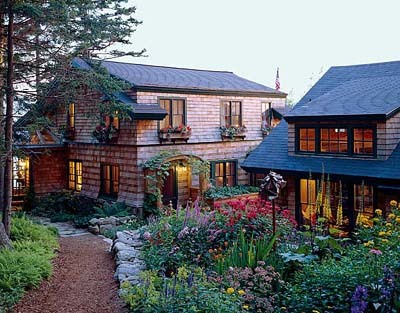 Sometimes, when he wasn’t designing the four other projects he had lined up in Rosemary Beach, he would turn a page and render drawings of his own modest architectural dreams. “You sketch these little gems on paper,” Mouen says, “and you never get to build them.” Except, that is, for the Little Beach House. 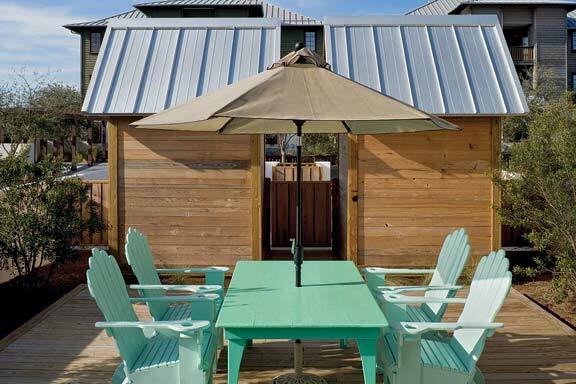 At a little more than 1,040 square feet with a single bedroom and a loft, the Little Beach House proves that simplicity can coexist with elegance. The home, which draws heavily upon Anglo-Caribbean aesthetics, is a seamless addition amidst the resort community’s tight, New Urbanism-influenced standards. And in the five years since construction was completed, it has been the backdrop for countless memories. New Urbanism relies on efficiency: smaller and more functional homes, neighborhoods connected by walkable streets instead of thoroughfares, and consolidation of space. The movement is rooted in the way cities were planned more than a century ago, but today, Mouen says it is also the best solution available to combat urban and suburban sprawl. Two matching storage sheds are perfect for holding bicycles, gardening tools, and beach accessories. Mouen, a Savannah College of Art and Design alumnus, has worked on a plethora of New Urbanist projects like Orlando’s Baldwin Park, Albany in the Bahamas, and Celebration, Florida, the location of his firm, Geoffrey Mouen Architects. 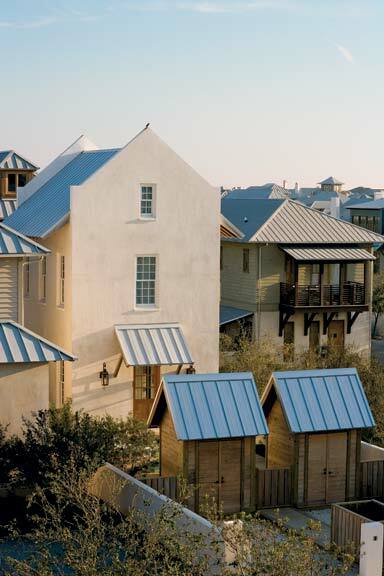 In 2003, Mouen and his wife bought a small lot for a beach house in Rosemary Beach, where strict building codes govern the materials and setbacks that can be used. “I wanted to design in an environment like that because I knew the standards were as high as they could be,” he says. Over the course of a year and a half, the home was economically built in a much more literal sense as well. “We’re architects. We’re not rich,” Mouen says with a laugh. 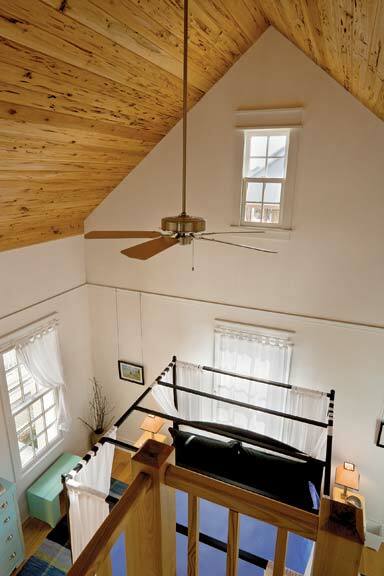 A loft overlooks the bedroom, which has a wonderful cathedral ceiling and fan to keep the room cool. 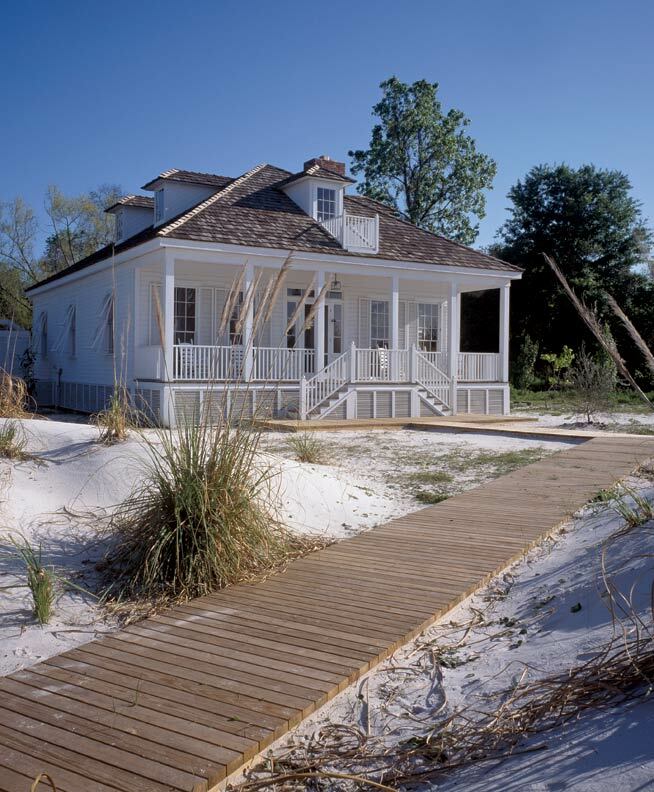 The Anglo-Caribbean influence on the Little Beach House—inspired by waterfront homes in the West Indies—is consistent with other homes in Rosemary Beach. The home’s stucco exterior is free of paint, save for the trim around the windows. 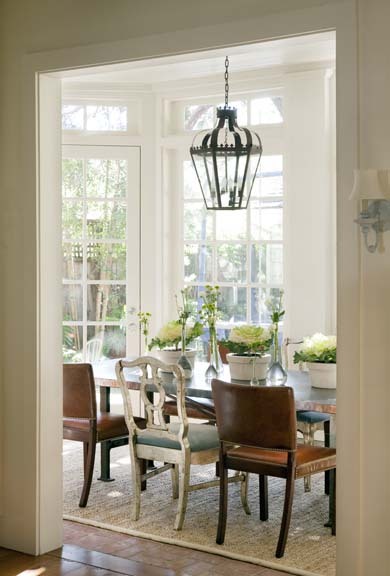 A modest stoop leads into a compact home—one room deep and one room wide—with pine floors and high ceilings. In the southwest corner, cherry cabinets and a granite countertop highlight a perfect kitchen for an avid chef. (“All you have to do is turn around, and there’s the refrigerator and the stove. You turn back around, and there’s the counter and the sink,” Mouen says.) In the opposite corner, a spiral staircase winds around a hard pine post to the second floor of the house. The simple metal handrail that wraps around the post had to be built three times to get the spiraling curve just right. Upstairs, the second-floor bedroom has a 15&apos;-high vaulted ceiling lined with cypress boards. A loft, for a study or a bunkroom, is elevated above the bedroom. Fourteen windows and two doors are placed throughout the house—very few face the public walkway outside—to provide ample natural light while maintaining a cozy, private atmosphere. “It’s really kind of a perfect beach house hangout for a small family,” Mouen says. Passive cooling features regulate the home’s temperature in the subtropical climate. “In this environment, we’re more worried about cooling the house than we are about heating it,” Mouen says. A reflective galvanized metal roof with Icynene insulation reflects the sun’s heat; otherwise, the concrete walls provide the home’s only insulation. The sun’s rays never shine on one part of the house long enough to significantly raise the inside temperature. When the thermometer does climb, the response is silence: The home uses a geothermal energy heat exchange system to cool the house rather than an air conditioner. 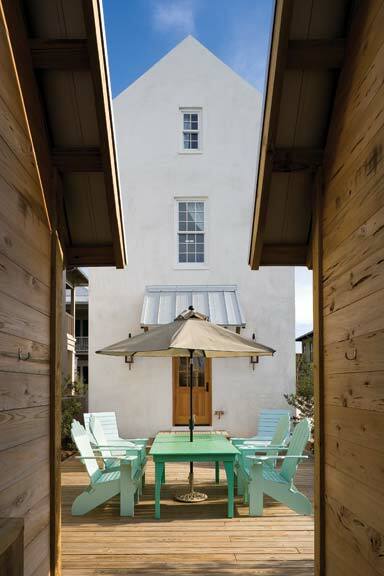 A rear stoop leads out to pressure-treated pine wood deck overlooking a courtyard. A canopy of trees casts shadows over the outdoor shower and wooden grill. Before the buildings were constructed at Rosemary Beach, Mouen says, winds from the Gulf of Mexico would knock down larger, delicate trees. “Now that the buildings are there, the buildings protect the trees so they grow much taller,” he says. Lush natural plantings of scrub oaks, ferns, and palm trees have burgeoned throughout the community. Jeff Harder is a freelance writer who has written for many publications. For a five-year-period he was also a managing editor at Cape Cod Life Publications.